CyberPower's CP685AVR gives you vital UPS statistics available on your systems at the push of a button. 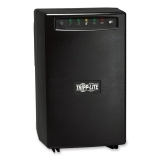 These models have has full dataline protection with 390 Watts of output, offering you enough time to close files and protect data in an outage. Compact and equipped with AVR line conditioning, this model is designed for Home & Office applications. PowerPanel software showcases the abilities of this UPS such as input/output voltage, self-diagnostics, schedules shutdowns, and backup/runtime. 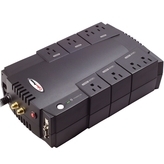 The CP685AVR has eight surge-protected outlets, four of which are linked to the battery power, with one spaced for transformer use, all in a compact unit able to protect all of your communications outlets and data lines. 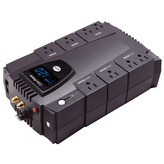 Automatic Voltage Regulation (AVR) ensures that all your electronics are receiving clean power and stabilizes the voltage to a nominal 120VAC. The PowerPanel software automatically saves and closes open files and shutdowns the PC in an intelligent and orderly manner, with audible alarms, current AC voltage, runtime, estimated shutdown, and a detailed log file. You see remaining battery power, and it tells you when things are back to normal. It's Windows Vista compliant, and manufactured in an ISO-9001 tested environment. CyberPower also offers a #1 rated technical support team that will assist you with product, installation, or warranty concerns! Protect your data and communications investment today! On a full charge of 8 hours, the CyberPower CP685AVR UPS will provide 2 minutes (at full load) or 10 minutes (at half load) of battery time, sufficient for closing your editing files and protecting data in case of power outage. 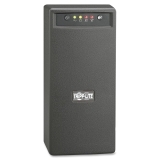 The built-in battery delivers 390W output, enough to support entry-level and midrange PCs with LCD monitors. With Automatic Voltage Regulation (AVR), the CyberPower CP685AVR UPS serves as an intermediary between the power source and connected devices to stabilize the AC power flow. Guarded by AVR, your devices are fully protected from most power problems via four battery/surge protected outlets and four surge protected outlets. The RJ11/RJ45 and RG-6 coaxial ports are featured for full dataline protection. The widely spaced outlets on the back panel of the CyberPower CP685AVR UPS provide best solutions to add large transformer-based plugs without compromising the utility of other outlets.